Colt Books - a link to various Colt related books for sale. U.S. General Officer Pistols - a quick link to an index of pages on Coltautos.com dedicated to pictures and descriptions of pistols issued to US General Officers along with history about the officers to whom they were issued. Sam Lisker's ColtCollecting.com - (a work in progress), ColtCollecting.com is a collector's resource devoted to the firearms produced by the Colt Patent Firearms Manufacturing Company in Hartford, Connecticut from 1836 to present. Colt's Manufacturing Company - Archive Services - to request a Colt Historical Letter on your firearm. Bob Rayburn's Colt Woodsman Home Page is an HTML version of his well known Pocket Guide. This site is devoted exclusively to the Colt .22 caliber rimfire autoloading pistols. 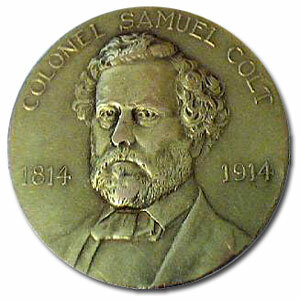 Whitehead & Hoag to commemorate the 100th Anniversary of Sam Colt's birth.